The past two weekends I’ve participated in two camps. Each was organized by Peace Corps volunteers for Ukrainian students. One in the city of Poltava, four hours south east of Romny, and one in the city of Kremenchug, six hours south of Romny. Camps are an integral part of Peace Corps Ukraine service and often the most creative outlet for volunteers. They provide an opportunity for our students to practice, develop, but most importantly use their English language skills outside of the classroom. Journalism Camp: Recreating Daft Punk's 'Work It' song with text. Every Peace Corps hosted camp is normally held for 1-2 days on the weekends during the school year or 1-2 weeks during the summer months. 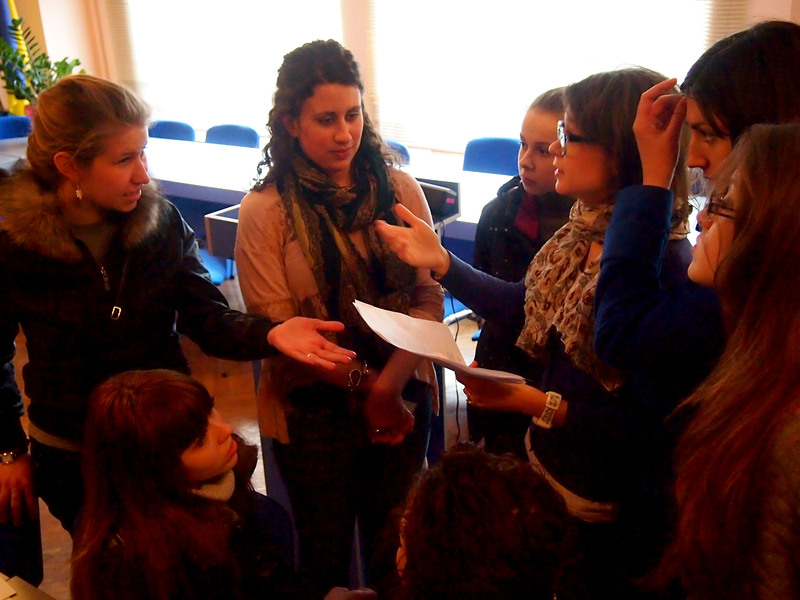 PCVs travel from all over the country to help at each camp but the Ukrainian students are usually local. The Republic Camp: Heated debate between the Merchants and Common People. A tyrant rules beautiful Athens and has proposed a massive 20 year long reconstruction of the Acropolis. However, many residents are upset with this use of their tax money and think it provides little gain for a great effort. In opposition, a group of residents proposed they rebuild the marketplace. It would be faster as well as more productive. The Republic Camp: Discussing the pros/cons of the Philosophers uniting with the Democrats. We then oriented our students on the factions various political viewpoints and discussed strategical maneuvers that could possibly produce their desired outcome. I was in charge of mentoring the Aristocrats but they needed little guidance since their goals were very narrow minded from the beginning. The students were then set free to argue and convince other political factions why or why not to support the tyrant, reconstruct the Acropolis, or rebuild the marketplace. In the end, our students decided to forcefully exile the tyrant, form an Oligarchy and ban together to present enough money to reconstruct both the Acropolis and rebuild the marketplace. The only people against this move were the Democrats, whose voice was to feeble to affect much change. It was a ton of fun and the kids got so into their characters and debates, some tears were shed in frustration! Of course all discussions, presentations & lessons were conducted in English. My camp this past weekend could not have been more different than “The Republic”. Organized, formal and fast paced, it was journalism camp. The goal of the camp was to create a newspaper. All the students were divided into teams of reporters, photographers and designers. Each attended classes on their various topics than produced a newspaper as a team. Various team building sport activities and scavenger hunts provided events for each team to report on and photograph. In addition, when the designers were putting finishing touches on the newspapers, the reporters and photographers produced short broadcast journalism pieces about the events of the camp. I taught the Design class, a great throwback to my days on the design staff of The Michigan Daily. Journalism Camp: The Red Team, the best team! I plan on participating in at least three more Peace Corps English camps this summer as well as hosting a weekend camp this May at my school in Romny. I believe these camps provide crucial elements of fun, creativity, practical use, exposure to native speakers and teamwork that are often lost or not valued in the average Ukrainian classroom. The major downfall of these camps is that they are not free for the Ukrainian participants and often very expensive due to the cost of their materials, food and lodging. IM OBSESSED WITH THAT COAT OF YOURS!!!!!!!!!! !